More than four years later, my views on niqab have shifted. At some point after my conversion, I flirted with the idea of wearing niqab but ultimately decided against it even though I had purchased several Saudi-style over-the-head abaya/niqab outfits. I never wore them outside of my house. I tried them on but found them completely unwieldy. My peripheral vision was diminished, it would have taken some getting used to the everyday walking, sitting, driving, and praying, especially getting up from prostration. And certainly, my family already not particularly enthused with my decision to wear hijab would not have been pleased. Oh, but isn’t it about pleasing God, first and foremost? Perhaps, and yes, ideally, but there’s often a great deal of people-pleasing that goes into our clothing choices, and this is true for Muslims and non-Muslims, both secular and religious. I believe my decision to wear hijab and abaya was primarily motivated by a desire to increase in my God-consciousness. The decision wasn’t well-received by those closest to me and at that time my main contact with Muslims was through online forums. When I was thinking about wearing niqab, I asked some other niqabis for their advice and input, I was curious about their experience and feelings regarding their choice. One sister in particular, who no longer wears niqab, advised me not to wear it out of the communal pressure that sort of “niqab is better and more pious” talk that permeates many conservative communities. In the end, I didn’t feel then and don’t feel now that niqab is obligatory or even preferable. I don’t think it would bring me closer to God nor do I think it’s necessary go to such an extreme (for me) level of covering in order to simply exist as Muslim woman in society. The struggle for some of us is to blend our cultural identities with our clothing choices. We want to dress modestly but neither wish to look “weird” nor assume cultural practices alien to our own culture. However, my personal feelings are beside the point. To force a woman to cover or uncover has nothing to do with justice and liberal values. Yes, women are forced to cover and they are also forced to uncover every single day by other Muslims and by non-Muslims and that’s really very sad and something we should all strive against. But the way to do it, is not by limiting choice and freedom, even if we disagree with those choices. I’ve been in several situations (renewing my driver’s license, working in a hospital, working for TSA) where I was asked or rather told that I needed to take of my hijab. That’s never a pleasant feeling and if you’re not strong or you do not know or feel able to defend your rights, you may give in to that pressure. In a similar way, I’ve been in positions where women that may not wear hijab have asked me for advice about whether or not they have to or should wear hijab in specific social situations. I tend to say, “no, you do not have to wear it” and to emphasize that it is their own personal choice and comfort which is paramount. And that I will support them in whatever they decide. It is this support that I think is critical and often missing. The support to choose for oneself despite the pressures, which seek to remove that choice. 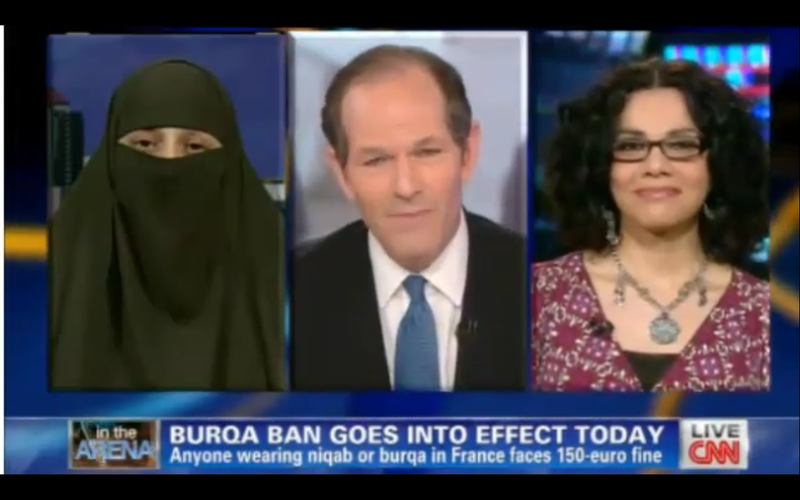 Nice clip on CNN of a debate between Hebah Ahmed, a niqabi, and Mona Eltahawy. For me, seeing Hebah and Mona is a victory of sorts, two Muslim women with two different ideas about dress comfortably explaining for themselves why and what they believe. I find it disturbing for someone who believes in women’s rights to try to deny women the right to choose a manner of dress for themselves. And I also find it equally disturbing that some of those who claim to support the right of women to choose for themselves in this case would quite happily deny women the right of choice if empowered in other settings. I know there are many women who continue to wear hijab or niqab simply out of the pressure to conform despite their wishes to not wear it. And I’ve seen women forced to take off their hijab or niqab for reasons of employment or safety or unjust laws like those in France or Turkey or elsewhere. I’m for choice, yours and mine. Another reason why I don’t support the niqab ban: Short documentary video about the life and choice of a Muslim woman wearing niqab. France is a sovereign nation. Please accept their rules and live in peace. If you don’t like those rules, fortunately for you, you are allowed to leave and return to any country of origin that better suits your needs. Religion is a personal matter, in most Western countries the rule of law is based on secularism. People are still welcome to believe and exercise their religion, as long as they don’t breach any laws, especially in public places. This is not to punish or humiliate anyone, rather to protect the historical customs of the people of the country. If you want respect learn to respect first, and remember that you are for the most part guests. So, please don’t take this law as a measure against Islam, as much as a protection and preservation of local culture.